Satellites play an important role in agriculture. Credit: Canadian Space Agency. You can add the Earth Observation (EO) community to the list of space communities that need a new long term plan. SpaceQ recently discussed with professor Chris Herd the new space exploration decadal plan, now the Earth observation community is looking at developing a plan of its own. 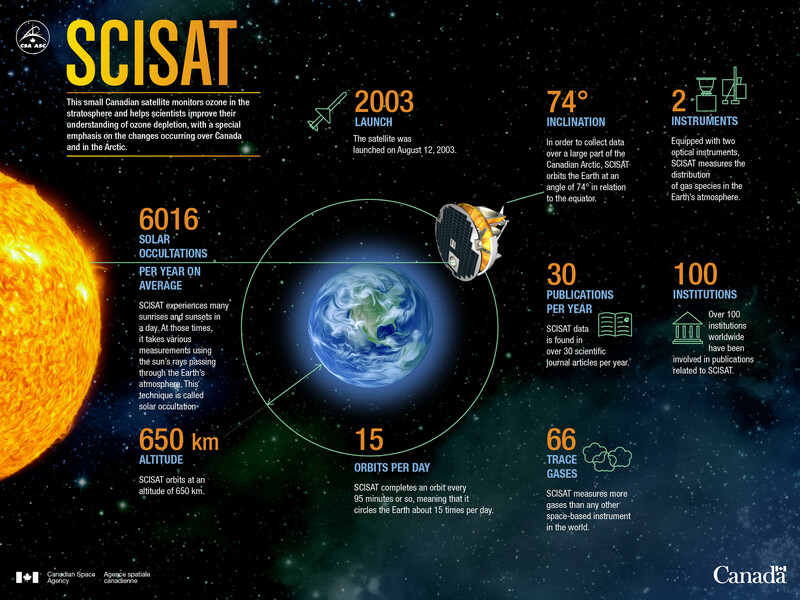 Infographic showing statistics on SCISAT, a small Canadian satellite that monitors ozone in the stratosphere and helps scientists improve their understanding of ozone depletion. Credit: Canadian Space Agency. Considering the importance of EO to Canadians, the forum was much needed. Like other aspects of Canada’s space program, one could argue this community has been neglected. While Canada gets a passing grade for working collaboratively on several International missions which include Canadian instruments, Canada has only two EO satellites of its own in operation. And one of those, SCICAT, is 15 years old and has survived beyond its expected lifespan. 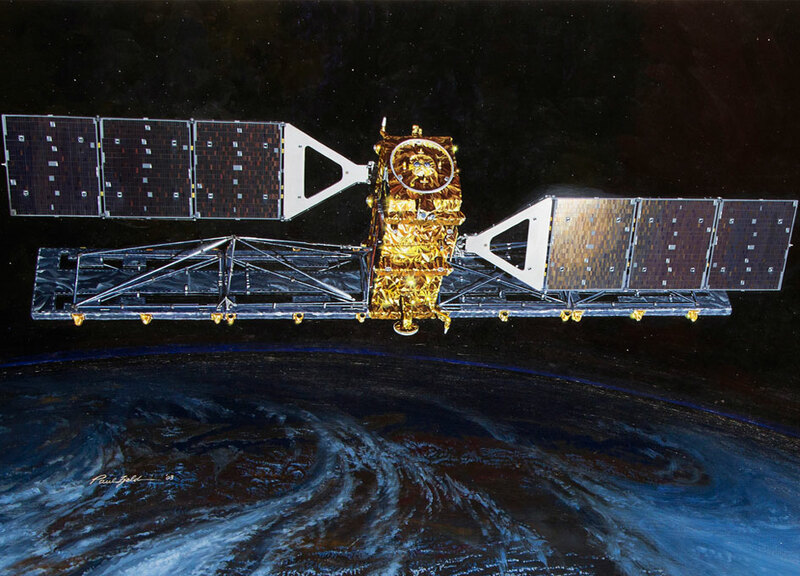 The other, RADARSAT-2 was paid for by the government but is owned by MDA. In a deal with MDA, the government paid the majority* of the costs of RADARSAT-2 satellite and then gave them ownership of the satellite. MDA invested $80M of its own funds. It’s a deal that will likely not be repeated. As part of the deal with MDA the government however does get annual allowance of data from the satellite which is provided to various government departments as well as being used internationally when needed for disasters. MDA continues to cover the costs of the operations of the satellite. A follow-on to RADARSAT-2, the RADARSAT Constellation Mission, three identical satellites, will launch in February 2019. However, that Canada has no other EO satellites funded is problematic. In an age where the cost of building and operating satellites is becoming cheaper, and with the advent of small satellites that use commercial off-the-shelf hardware, the government really has no excuse for not doing more. At the same time, advances in technology are allowing startups to offer services and take on the burden of paying and building satellites, instruments, software platforms, ground stations etc. The advent of new commercial offerings is providing government options to pursue a strategy that could see them follow a traditional path of tendering new EO satellites for government use, and at the same use commercial offerings to supplement what they need. This is in part where last weeks National EO Forum was designed to help. By bringing stakeholders together and creating a new vision that takes into account the changing dynamic of the EO segment, the government will hopefully position itself to follow the best path forward, and one that will work for all stakeholders. SpaceQ asked to attend so as to report back to the public what was discussed at the Forum. We were permitted to attend the first day of the three day forum. We did so by joining the teleconference option available to those who could not attend in person. In the next two days we will publish two stories on what was discussed on that first day. * Updated at 1:31 pm ET – To include the that MDA paid a portion of the costs to build the satellite and ground segment.